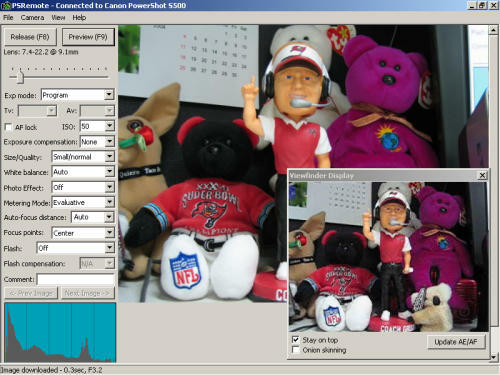 Breeze Systems PSRemote is a Windows (98, Me, 2000, XP) application for controlling Canon Powershot cameras from a PC via the USB connection. It gives a high degree of control over the camera and includes a live viewfinder display allowing the camera to be operated up to 5m (16 feet) from the computer using a standard USB cable. You can download a trial version of the program from the link above. Trial versions can not save the camera images to disk. This is an excellent program and I'm sure that once you have tried it on your computer you will be happy to send the author the registration fee. Pro1, G1, G2, G3, G5, S30, S40, S45, S50, A30, A40, A60, A70, A75, A80, A300, A310, S100 (Digital IXUS), SD100 (Digital IXUS II), SD110 (Digital IXUS IIs), S230 (Digital IXUS 330), S400 (Digital IXUS 400), S410 (Digital IXUS 430), S500 (Digital IXUS 500) cameras. The S1 IS will be supported in the next version of PSRemote. In addition to the preview image in the program you can enable a Live Viewfinder window, the camera's LCD monitor or a TV via the Video Out. When you run PSRemote it attempts to connect to the camera. The first time it connects to a new camera model it needs to learn the camera's settings and this can take a while (30 secs or more depending on the camera model). The settings are stored and connecting the next time will be much faster. You can manually connect and disconnect from the camera by selecting the appropriate entry from the "Camera" menu. If more than one camera is connected to the PC when PSRemote is run a selection dialog will be displayed listing the available cameras. Click on the Release button (or press F8) to take a picture. 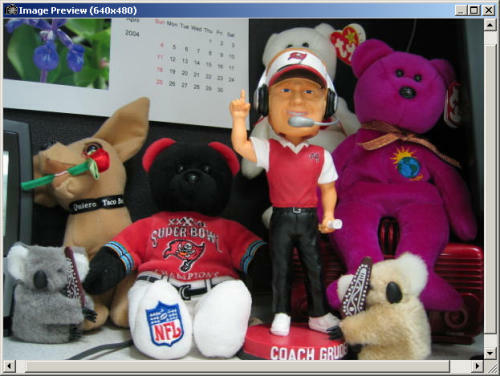 The picture is automatically downloaded to the PC, displayed in the main window and saved to disk. Images can be stored on the PC's hard disk, on the camera's memory card or both. The camera's shutter release can also be used to take pictures. The shutter release is the only camera control which is enabled when the camera is in remote mode. All other camera settings have to be set from PSRemote on the PC. Camera menu options: Register for camera events means that PSRemote will be run whenever the camera is plugged into the USB cable. Live Viewfinder enables the separate window (not available in all camera models) display that is constantly updated from the camera. Time Lapse enables the interval recording function (see below). View menu options: Grid Settings and Display Grid puts framing-assist marks on the viewfinder image. Flashing Highlights will show potentially over-exposed highlight areas in the preview image. The image preview option lets you browse the captured images saved to disk. Preferences: Mouse middle and right button (release, preview or edit), mouse wheel (zoom or Tv/Av), Preview image size (small, medium, large). Some cameras (e.g. PowerShot G2, S30 and S40) allow the setting of the image contrast, sharpness and saturation. Use the controls in preferences to set the desired image parameters. These controls will be disabled if the camera does not support this. And of course how to name the captured images and where to put them on your computer. Time Lapse recording can begin immediately or you can set the start date and time for delayed operations. Specify the interval between frames and end after a set number of frames or at a specific date and time. PSRemote also includes a DLL and a sample program which allows other applications to release the camera's shutter and adjust the shutter speed, aperture, zoom etc. This opens up many exciting possibilities such as movement or sound sensors being used to trigger the camera for taking wild-life shots.